It’s almost officially fall — which means it’s apple season here in West Michigan. 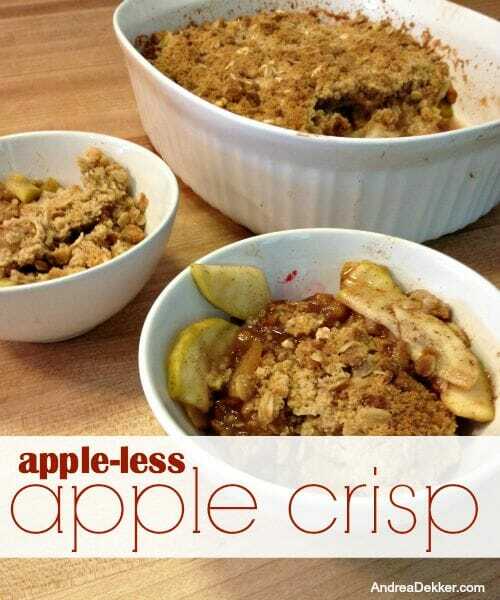 Apples have been my favorite fruit for as long as I can remember, so I’m always looking for new apple recipes to try. 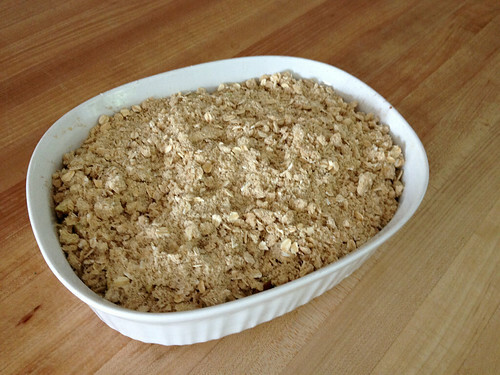 I’ve acquired plenty of yummy apple recipes over the years, but today, I’m actually sharing a recipe that tastes (and smells) exactly like a yummy apple crisp, but… there’s not a single apple in the entire dish! Instead of apples, I use zucchini! Yup, that’s right — zucchini crisp! I fooled Dave, my parents, my aunt, my kids, and everyone else who has tried my zucchini crisp recipe. 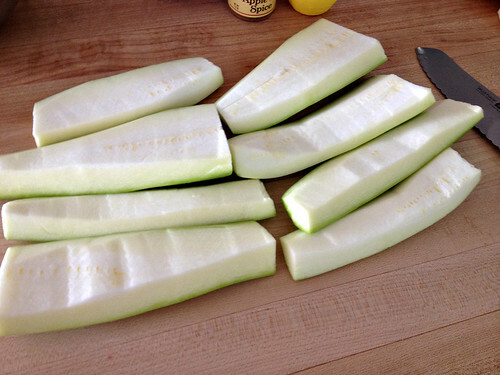 Plus, I used up a whole bunch of zucchinis from our garden! 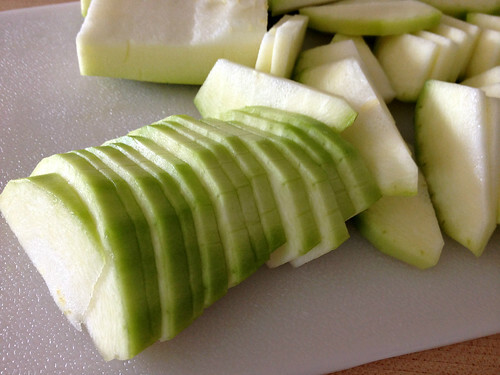 What’s so amazing to me (besides the fact that the zucchini truly does taste like apples) is that the sliced zucchini actually LOOKS like sliced apples! Even after I told people about the zucchini (usually about half way through their bowls) they just couldn’t believe me. Dave thought I was joking for several minutes before I finally convinced him by showing him a couple seeds that were left behind in one of the zucchini slices. And speaking of seeds, as you’ll see in the baking instructions below, I peeled and seeded the zucchini before slicing it. I would definitely recommend doing this as the peeling and seeds will not improve the taste of this dish. 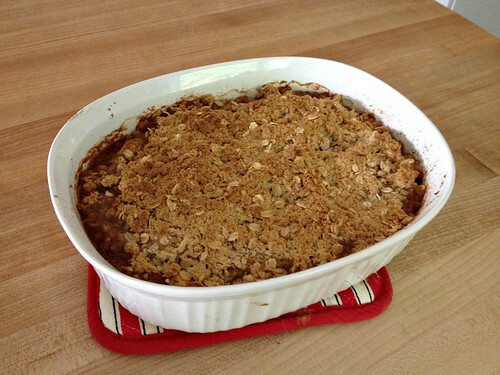 This dessert tastes fabulous warm out of the oven, or room temperature the next day. Just don’t forget to add a scoop or two of vanilla ice cream! If you’re looking for a way to use up extra zucchini — or if you just want to fool your family and/or dinner guests, you should give this one a try! I should state the obvious — you can certainly substitute apples in place of the zucchini if you’d like (or do half and half). 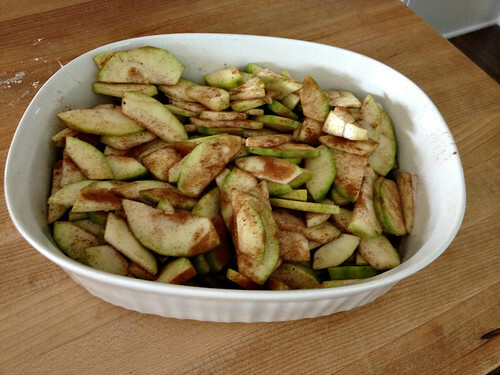 Just cut back on the lemon juice if you’re using all apples (maybe only 1 T. or so). 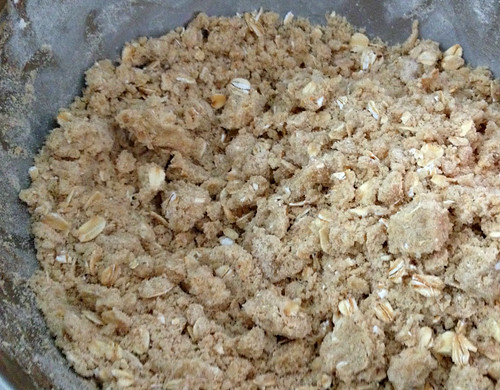 It was so fun to try this recipe, and even more fun when I realized how great it tasted. 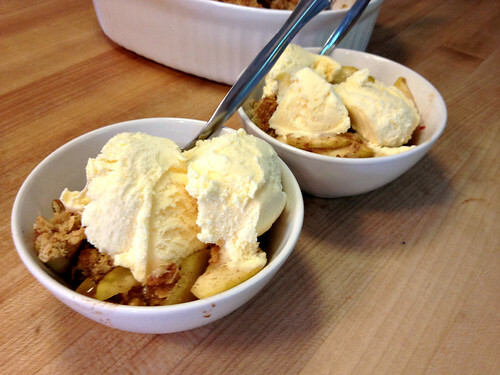 What is your most crazy dessert recipe? Just found this on Pinterest; my 26 year old son found out a few years ago that he has a bad allergic reaction to apples and pears. Odd though because he ate them a bunch growing up, and it was his favorite pie. I am going to try this for him the next time I bet to visit and see what happens. Now I must go back and find your ugly garden that I see comments about. oh wow — glad you found this recipe! It’s SOOOO amazingly delicious I promise he will NEVER know it’s zucchini! This was so yummy! I made it for dessert after Sunday lunch when one of our pastors came for dinner. Everyone said it was wonderful. Thanks again for a great recipe. yay — glad to hear you liked it! 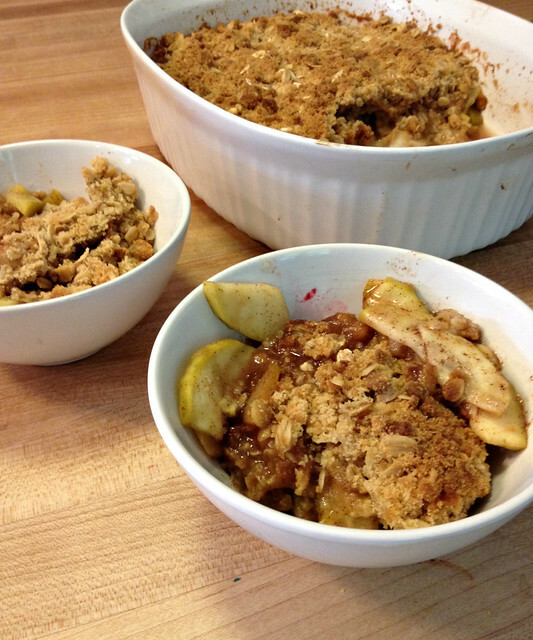 I made the Almost Apple Crisp to take to a card party. I did not have enough zucchini so I added a can of drained pineapple chunks. got rave reviews and I really think the pineapple added a lot to the flavor. .
My family that lives near Black Sea cook a fish desert! Yes, that is true! So there truly is no limit when making deserts! I tried this recipe today with a giant peach & some frozen berries that had both been in the fridge for awhile. Only cooked it 25 min – it was Wonderul!!! Thank you, Andrea. Earlier in the day I used your “ugly garden” idea to give me the freedom to plant a tiny, sloppy fall garden with my 4-year old grandchild. Your website & your willingness to share ideas and perspectives are a true inspiration to others. oh yum! peach + blueberries is such a great combo! This is a wonderful recipe. I tried it for the first time at a family gathering and was surprised it was zucchini. I had forgotten all about it. I have two zucchini on my counter right now and maybe I’ll use them for this delicious dessert. I found the following information on a website I visited because I, too, was wondering why my zucchini plants were not producing zucchini. I am guessing my yard (and the others who have made comments stating their plants aren’t producing zucchini) doesn’t have enough bees visiting to help with pollination. I am wondering how to attract bees to the yard. Andrea, you never cease to amaze me! This looks delish 🙂 You’re so innovative! 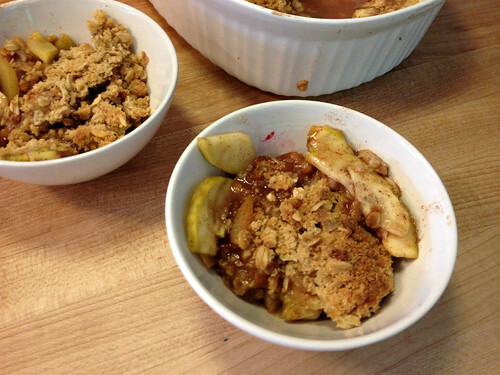 Ooooh…..I have zucchini in my grocery list to make zoodles but I’ll have to get more so I can make this dessert! Yumm! 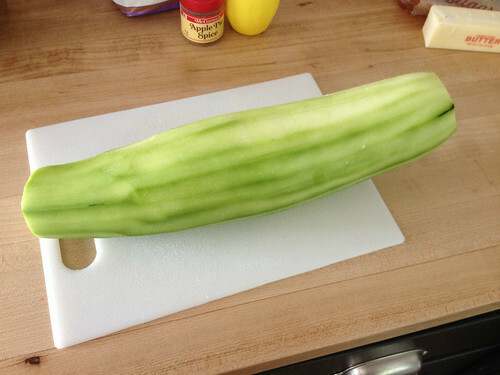 I have no idea why, but I can’t grow zucchini in my garden, either! Every year there’s a huge Zucchini Festival Saturday about 20 miles away celebrating the harvest, and my garden just laughs. I won’t even plant it anymore! Andrea, about how many zucchinis (should I buy :-p) to make six cups? Well Evie, it depends on the size. 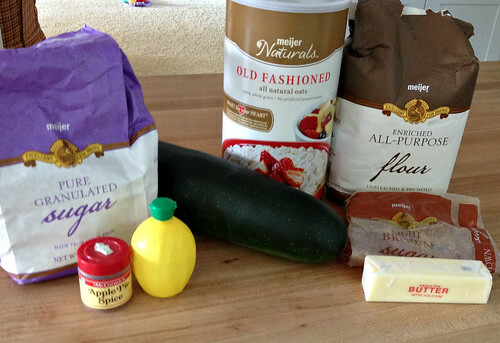 For this recipe, I just used the 1 large zucchini in the pictures and had plenty (even after I cut out the seeded parts).